A hiss, a boom, and a pop. There goes the fireworks in the sky. Their bright sparkles lighting the dark sky. Celebrating whatever the occasion may be. Bringing smiles to faces young and old as they look to the sky mesmerized. 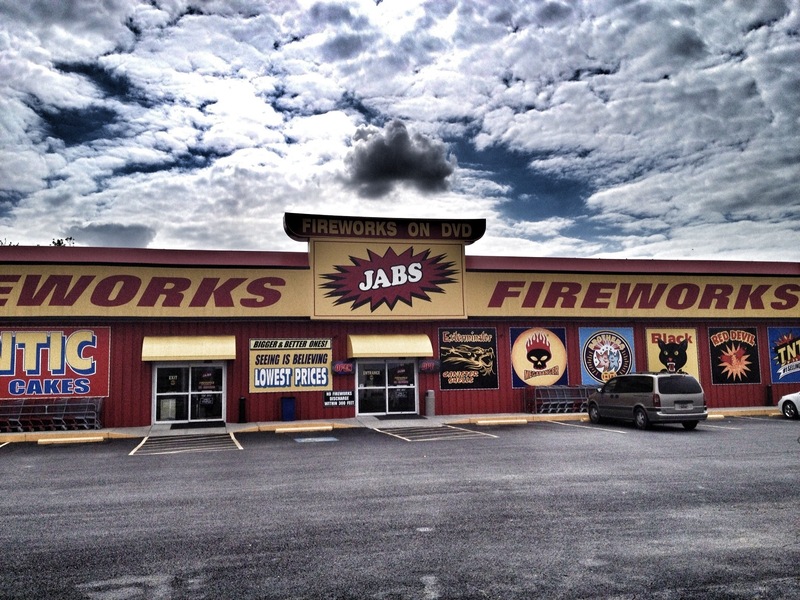 Traveling down I-95 one sees these firework stores selling show worthy works. Yesterday the shocking booms in Boston has rocked the world. A senseless act for no real reason at all. Let’s join those who are suffering from this tragic incident in spirit and prayer. Captured by iPhone 4S, edited in PS Express and Snapseed. Post created on iPad 2 with WordPress app. I have a hard time beliving in angles, but I do think that if they are real, that Newtown and Boston would make them cry. That is so true Charlie. The hatred that caused the two suspects to do this is unthinkable. I will never understand the minds of those who can not only set off bombs in crowded areas, but construct the bombs in such a way as to rip innocent people to shreds. It does make me wonder what makes a person to despise life so. If only they would watch more birds and spend more time in nature perhaps their hearts wouldn’t become so black. Thanks Tom ! Not bad for a ..oh crap! I need a photo for today while on a 11 hour road trip. Thankfully I had my iPhone at the ready. Yes, the DVD is rather odd. I can’t even imagine what it was like during the disaster Drake. Such sadness in a time that was meant for celebration. My younger brother live sin Boston and normally him and his wife attend the marathon but this time they did not. Sadly, however, the third fatality was their very good friend. Oh that is such tragic news Phil. I can’t believe how close this is to your family. Luckily your brother and wife are safe. But at what price? Thanks for sharing. The cloud above the firework building is spectacular. Sun Run is coming soon here in Vancouver and we are all praying for Boston and we hope the Sun Run will be a peaceful event. I got lucky with the app that really made that cloud ‘pop’. Vancouver is off the radar, so your run should be completely successful.